One of the humidity sensor currently in use, on the Home Automation Project, is the ubiquitous DHT22 also known as AM2302 which came with the AirPi board I installed. I don't particularly like it as it has a very specific protocol which need a special C-compiled software to communicate. Second problem, it sometimes crashes. And lastly, I am starting to have serious doubts about its accuracy (specially on the humidity side). I discovered an alternative known as SHT21 or HTU21D (depending on the manufacturer) which seems quite appealing as this one use the perfectly standard I²C protocol. 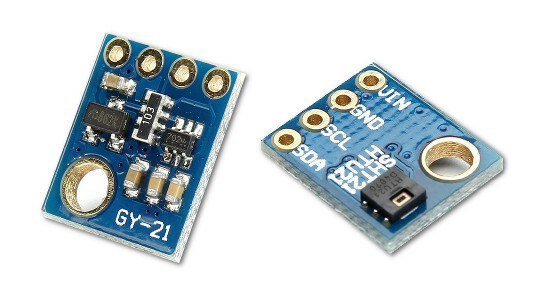 That said, the chip is so tiny, the only way to use it is mounted on a breakout board (like the GY-21): For around 4€, you get the sensor, the power regulator as well as a level shifter. Which means that it can safely be used with 3.3V or 5V. Basically, it works by sending a Read (humidity or temperature) command, wait (hold mode) or poll (no hold mode) for the answer and apply a mathematical formula to get the actual value. There is a precision setting but the only effect is to reduce the measurement time and since on the default/highest setting it takes less than 50 ms, there is little need to change it. As I wanted to experiment with the ESP8266, I (temporarily) diverted the chip from its initial goal (i.e. replacing the DHT22) and decided to use it on the Arduino plateform. There are librairies available from Adafruit or Sparkfun but I created my own version to include soft reset as well as serial number reading. I'll publish it as an example at some point in the future. Later, using this chip on the Rasberry Pi with python should be trivial. So far, the only small drawback I found with this kind of chip is the fixed I²C address (0x40) which mean there can only be one sensor per bus. But in practice, there is little need for more than one anyway.